I have decided to join in with the Timeless Thoughts linkup hosted by Georgie and Tara. It is where bloggers write about something from their past. For more information, check out Tara’s blog by clicking the banner at the bottom of the page. Back in 2005 there was a social media website that got teenagers world wide interested in web development. This website was Piczo. Piczo allowed users to simply build websites by adding features such as text, images, guestbooks and HTML codes, and then drag-and-drop them into position. It was eventually bought by another company before being closed down in 2012, but during it’s short life span Piczo changed my life. If it wasn’t for Piczo I probably wouldn’t have learnt to code, I probably wouldn’t have started a blog, and I probably wouldn’t be working as a web developer. So naturally, Piczo has a very special place in my heart. Today I thought I would reminisce about a few of my key Piczo memories; some good, and some I think we’d all like to forget! Competitions in the Piczo days were not like the competitions we are use to seeing today on bloggers. There were never physical items up for grabs, but instead you could win free advertising and an awesome image/certificate to place on your Piczo site to let everyone know how awesome you were. Award pages were not uncommon either. I don’t think any Piczo users cared about copyright, or probably just weren’t aware of it in the first place. Everyone used to just steal images from other people’s Piczo sites and stick them on their own sites without giving credit. Can you believe it?! We also use to use and abuse celebrity images as nobody knew that this was incredibly wrong (although I guess some people still don’t know this). My Piczo site was plastered with pictures of Heath Ledger and I wasn’t even slightly sorry. Glitter graphics were a staple of Piczo sites. They were tacky, annoying, and oh so glittery. But we didn’t realise it back in the day, and they were on everyone’s enter page, home page and about page. And if you had a big enough collection then you probably had a glitter graphics page to show off your stash. Towards the end of Piczo’s life, glitter graphics died out and you wouldn’t have been see dead with them on your site. Thank goodness we all developed some taste over the years. I remember visiting some other Piczo sites and discovering that they had really “professional” (my idea of professional has changed drastically over the years) looking websites. I was amazed because I couldn’t figure out which in-built Piczo features they had use to make their site look like that. Of course, they had gone beyond the features of Piczo and used this magical thing called “code”. This is when I discovered HTML & CSS. It’s also when I discovered, to my complete horror, that not all websites were created by dragging and dropping featured onto a page. My world changed forever that day, even though I didn’t know it at the time. Did you ever use Piczo? If so, what are your memories of the site? For more information about this linkup, check out Tara’s blog by clicking the banner above of the page. I can’t say I’ve heard of Piczo, but they sound like what Geocities was to me LOL That’s where I first made my website, and they had a horrible website builder (well, this was like 1999-2000! ), and that encouraged me to learn HTML and CSS. It’s good you have fond memories of Piczo. I don’t have that same fondness with Geocities, but I do begrudgingly thank them for influencing me into website coding! Thanks for participating, Holly. Be sure to add your link to the collection on my November post. I’ve never heard of Geocities but it certainly sounds interesting. We didn’t have internet at home until like 2003 so I was too late to the party. Thanks for the reminder. I’ve now added my link! YES! Piczo is what got me interested in coding and photoshop. And it is honestly one of the reasons why I now study computer science. It was so easy and fun, and really a great platform for kids like us to learn. I remember the biggest magic of it all was when I figured out how to put an iframe object into one of my pages. Haha I remember using Paint Shop Pro 8 instead of Photoshop because I thought it was easier (plus I knew where to download it from illegally – shame on me!). I feel like Piczo got a lot of young people, especially girls, interested in coding. Really, it’s a shame it disappeared. I remember those competitions that used celebrity images! You’d have to make an icon or a “blend”. Remember “blends”?! Oh, yes! I think I might have some left on deviantart thet I need to delete soon. Haha, I forgotten all about that.. This was so funny to read. I never used Piczo, but I used Freewebs, and things like the glitter graphics and competitions were oh-so-popular on Freewebs too. Thank you for joining the linkup too – a lot of people have written about physical and more childhood-like things (if that makes sense), but I have only come across one other post that was about something to do with the internet. It is crazy how much the internet changes over the years. Competitions were quite funny because I remember wanting to get more users to interact with my website, so I held more competitions. I did a Site of the Month, a Moment of the Month (where you submitted embarrassing moments) and other -OTM kinda things. I also did a song lyric competition, and that was before any of us pre-teenagers knew that you could actually search for lyrics on the internet. HAHAHA. I remember trying Freewebs but I couldn’t understand it. Probably because my HTML stills at the time were still pretty limited. Oh my goodness, Site of the Month! I remember setting up a poll so people could vote from the selection of people who entered but people always cheated! I also tried the lyrics competition once and I couldn’t understand why people managed to guess such an obscure song. I was so slow to realise they’d just Googled it! I wish I still had my old computer as it was full of all my Piczo graphics, including awards. It would have been so fun to look back through. I remember getting to know about Piczo on a forum. I made my first website on Piczo which all its glitter and stuff. It was so childish but then we were also kids at that time. Piczo had these Harry Potter blend contests and so much more. These were the catalysts one staring to love computers and the world of Web technology. I remember we all made a sudden transition from .piczo to freewebs and then eventually got into what we are now! 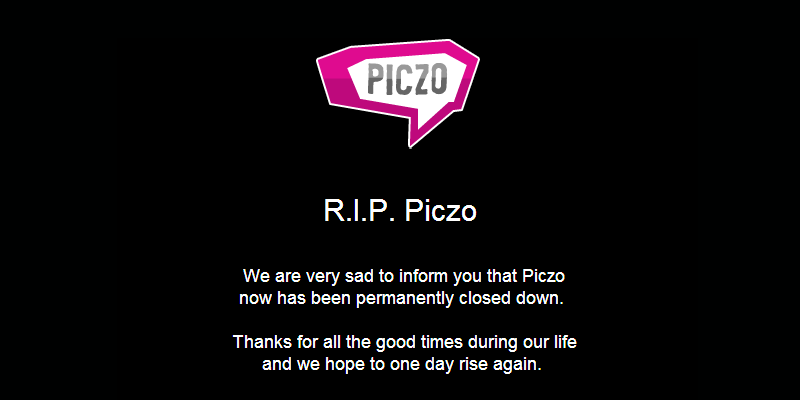 Unfortunately, I don’t have fond memories of Piczo. When it was around, I was on my domains already, and Piczo users kept stealing my graphics and layouts 🙁 I can relate to learning HTML and CSS on a free host though! Back when I was starting out, Angelfire, Geocities, and Freewebs were the popular ones. I totally remember having an awards page too from graphics contests I had won 🙂 I actually kind of miss those that were just for fun and weren’t costly to run. Oh no! But that doesn’t surprise me about Piczo users. I feel so guilty when I look back! I didn’t use Piczo, I used Geocities, but so many of my friends did! Gosh, I remember glitter graphics vividly – in a strange way I miss them in all their tackiness. I had an awards page too, filled with really weird awards from other sites like “Graphics of the Month” or “Gold Web Award” – I don’t really think I did anything to deserve them….. I remember entering loads of blend contests and icon contests too, I used Harry Potter pictures until I had a dream the internet police arrested me for copyright so I used pictures I got from a Windows XP Magazine disc. Gosh you’ve opened the floodgates with this post! I miss those early days! I’m so intrigued by Geocities. I’d never heard of it until I published this post. I miss their tackiness too!! Haha, the internet police! It took me so long to remove celebrity images from my website, even when I moved to my own domain. I didn’t think I’d get caught, and fortunately I didn’t. Seems like today is a day down memory lane!! I have heard of Piczo but was more familiar with Geocities and many others. I started out on Geocities as well, and local community sites… such as [mycity]planet and stuff like that. Pretty funny that Facebook has overtaken that marketspace. Thanks so much for sharing this, it is definitely a fun post! It was such a different time in those days. I never used the website myself because I had my own hosting than (I began on Geocities). I did know a lot of people that had sites there and it could be really interesting. I also loved the ‘icon phase’. I can remember creating so many 100 x 100 icons. I’m so curious about Geocities now you guys are all talking about it. Can we get a time machine so I can go back and see it?! I once set myself a challenge of making like 10 icons a day. I was obsessed! Geocities is nothing to see, Holly. It was oh so full of ads, at least that’s how I remember it. As were most of those free hosts in those days. Maybe there was some paid version that I never used. I didn’t use Piczo either. I was on Freewebs and a few more, the first social networks. I remember those blinkies and glittery stuff – terrible! All those sites were so ugly. Actually the ugliness of social networks was what brought me to blogging. I wanted to be able to create my own site where I was the boss over the design, so I started learning CSS. Then i went from Xanga to wp.com to wp.org. And back then we didn’t have AdBlock!! I think Piczo had a paid version but I was only 13/14 at the time so I didn’t have a bank card. That’s also the reason why it took me so long to buy a domain!